That’s how far away Hunter Ladnier was from securing a spot in last year’s NCAA Championships. Though the Crimson combatant clawed his way to the top of last season’s NCAA qualifiers, he was ultimately taken down by Navy’s Jared Prince in his semifinal match. 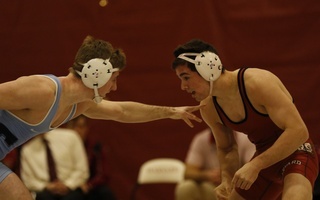 However, Ladnier, now a junior and captain of the Harvard wrestling team, plans on turning that around this year. Having made it to the NCAA Championships during his freshman season, a successful run at this year’s EIWA Championships would secure a second appearance in the NCAA tournament for the Ohio native. And, according to Harvard wrestling coach Jay Weiss, the premier competition in college wrestling may just be coated in crimson this year. For the Crimson, the journey to the NCAA Championships is a long one. Because the wrestling season doesn’t truly begin until mid-November, the team’s preseason training is “very long,” as Weiss puts it. However, this drawn-out practice period just adds to the wrestlers’ dedication. As the wrestlers prepare for this weekend’s Jonathan Kaloust Bearcat Open, Harvard’s first bout of the season, the competitors in crimson are enthusiastic to break from their typical schedule. Though the team differs from other Crimson squads in that it lacks a substantial senior class, the Harvard team is expected to be one of the best in the Ivy League this season. Weiss cites the experience of his juniors and sophomores, along with the potential of his team’s freshmen, as overall strengths for the squad. However, wrestling isn’t the only activity that the team has been focusing on. The Crimson holds the distinction of having earned the highest cumulative team GPA in the country for three years in a row, an achievement that the squad holds high. This year, Harvard plans on turning three years straight into four. This mantra of being great is one that Coach Weiss repeats frequently. Ask any Harvard wrestler and they’ll tell you that striving for greatness is the team’s foremost ambition, both on the mat and in the classroom. As the wrestlers head to Binghamton, N.Y. this weekend, Coach Weiss’s mantra will almost certainly be on their minds. After months of tough training and impassioned practice, the Crimson is ready to face its first battle. And for the Harvard wrestlers, greatness is only a few pins away. Varsity Field Problem . . .
Wrestling Season Comes to an End — Or Does It?